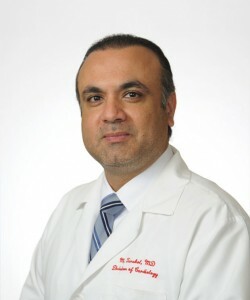 MORTEZA TAVAKOL, M.D. joined our team in July of 2013. He has a Bachelors and Masters degree in Physiology from UCLA, and obtained his M.D. from St. George University. He completed his Residency & Cardiology Fellowship at New York Methodist Hospital, an affiliate of Weill Cornell Medical College. His areas of interest are in structural and valvular heart disease, coronary artery disease, cardiomyopathies, and the use of multimodality cardiac imaging. He specializes in advanced echocardiography, including 3D and tissue tracking modalities to diagnose and treat heart conditions. He is board certified in Internal Medicine, Cardiology, Echocardiography, Nuclear Cardiology, and Vascular medicine. He is a member of the American College of Cardiology and the American Society of Echocardiography. He and his wife Sophia, also a physician, are the proud parents of a young son.